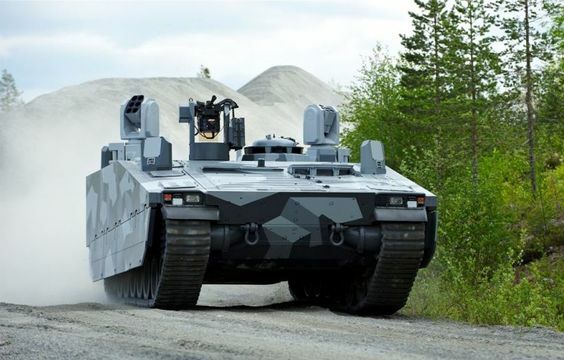 Commonly referred to as the Combat Vehicle 90, the CV90 is a family of Swedish Tracked Infantry Fighting Vehicles developed from the Stridsfordon 9040 aka Strf 9040, built by the former company Hägglunds, now part of BAE Systems AB. 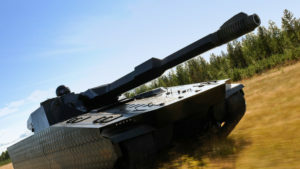 The Strf 9040 hull has served as the testbed for a number of proposed medium tank designs. 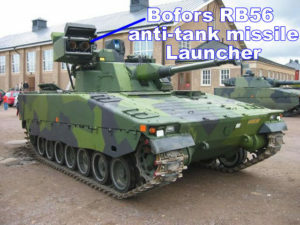 These have sported different turrets armed with rifled 105mm and 120mm smoothbore main guns during the late 1990’s when many people speculated the Main Battle Tank would be made redundant in favor of these medium tanks, a concept that has been proven wrong with countries still buying MBT’s. 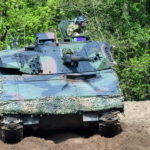 The Strf 9040 and export models of the Infantry Fighting Vehicle are in service with 7 countries in Europe and trialed in a number of others. 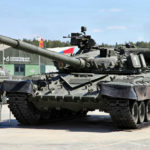 The Strf 9040 has since been upgraded for the Swedish Army, modified to spec for export clients, such as armor, main gun and fire control systems. 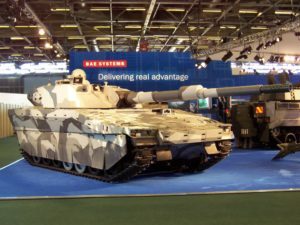 These receive new Mk designations and new CV90 names which include the caliber of the main gun. 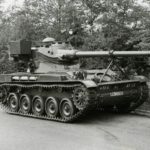 During the development and trial process, Sweden trialed the Strf 90 with both a 25mm and 40mm cannon, with the possible intention of a mixture of the vehicle fitted with both cannons. 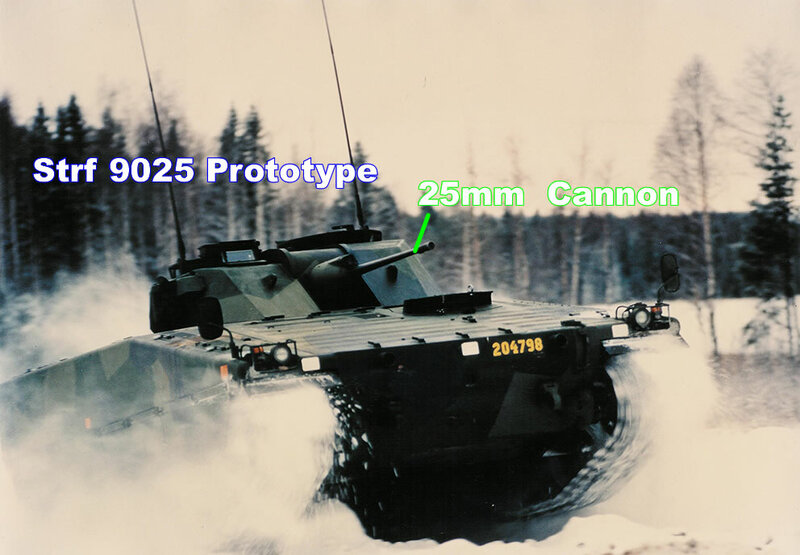 The 25mm idea was dropped and remained at the prototype stage. The eventual production model was known as the Strf 9040. 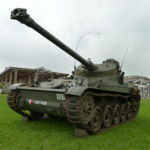 It is armed with a Bofors 40mm main gun, which was un-stabilized limiting its fire on the move capability. 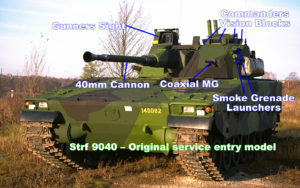 The in service Swedish Strf vehicles were/are considered as Mark 0 aka Mk0. Developed as a Self-Propelled Anti-Aircraft Gun, the 40mm main gun has an increased elevation. 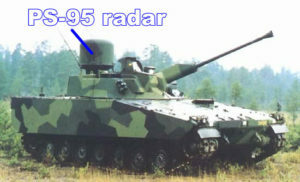 Detection and tracking is via the large PS-95 Radar system mounted on the right side of the turret. External mounting of a gun stabilization system to the left of the main gun. All earlier production model upgraded to this standard. 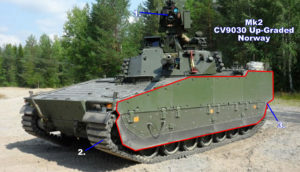 (Norwegian CV9030N). 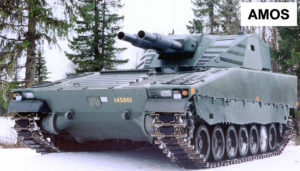 The Mk1 was the export model of the CV9040. Armed with a 30mm main gun and up-armored to meet the needs of potential such as MEXAS used on Norwegian CV9030 (aka CV9030N). External gun stabilization removed and now internal. In addition, Gunners back up sight mounted on left side of gun. 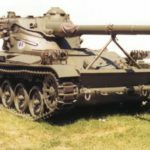 New Hägglunds turret with Ruag 120mm smoothbore main gun. 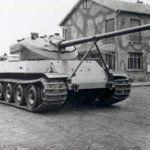 Uses Mk0 hull and the turret was later upgraded. 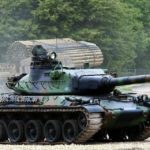 RB56 ATGM system trialed. Was eventually dropped and did not enter service. 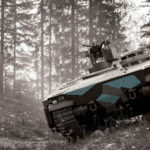 Joint project between Hägglunds and Finnish Patria, who created a new company for the project. 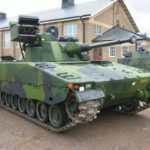 Swedish Army interest in the project fizzled out and was not purchased. 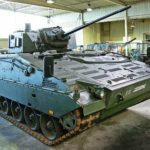 Complete modular AMAP armor system installed, probably the most heavily armored Infantry Fighting Vehicle in Europe. Not all Strf 9040B have been upgraded to this model. Visible changes in the turret rear (point 1. above), saw an improved engine and Digital environment. Proposed armor upgrade of the Mk2 by Rafael. No orders purchased. 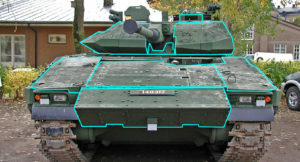 Improved version of the earlier CV90120 with AMAP-ADS Hard Kill System. 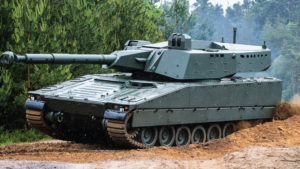 The CV9035 was delivered to both Denmark and the Netherlands from 2007 onwards. 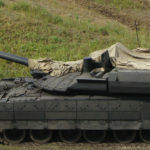 The CV9035 does have armor upgrades, but not always used. These include the Roof PRO-P (marked in Yellow) and a standard armor upgrade to the hull sides and front. Developed for the British Army Future Rapid Effect System (FRES) Scout Role to replace the CVR(T). GDLS ASCOD design was selected in 2010 and the project ceased. Armed with a 40mm cannon and heavily armored. New camouflage system. 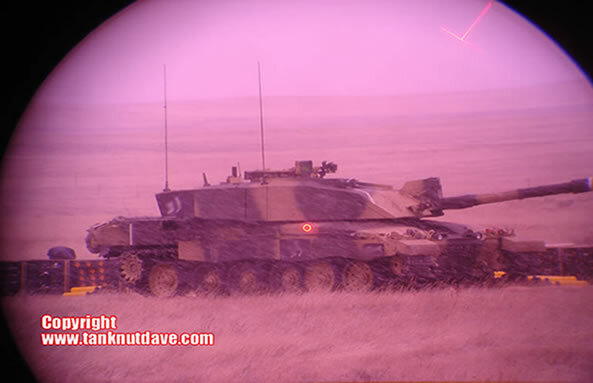 The Commanders Sight also has cameras to take photographs of surroundings to project on ADAPTIV armor. Additional AMAP armor replacing older system for increased protection. Not in service. Details of Vehicle: Mk 0. Analog environment & 14 Litre Scania Engine? Joint project with Cockerill, the installation of their XC-8 105HP turret. 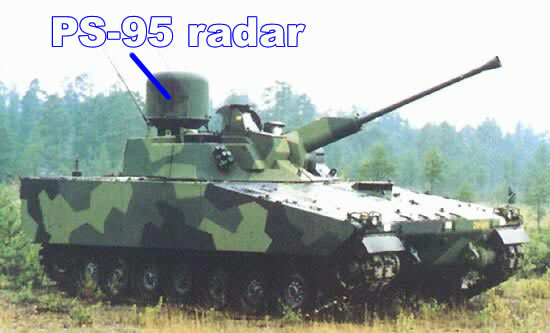 Built as an APC but photographed with a Remote Weapon Station fitted with a 30mm main gun (pictured above). Uses rubber tracks and other advanced mobility components. The vehicle has been trialled in Denmark for trails. 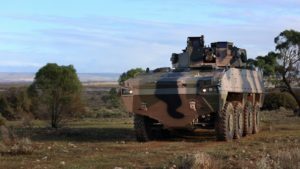 BAE Systems offer the Australian Army the CV9035 Tracked IFV for their Land 400 Program Phase 3. Phase 3 selection and trials TBA at a later date. 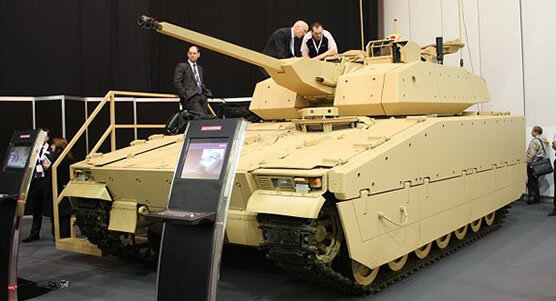 Vehicles would mmost likely be built at BAE Systems Australia. Please note: (unless otherwise stated) all operator numbers ordered, dates and price info is obtained from the Arms Trade Register. 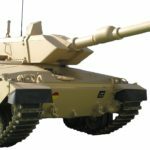 You will find links for dedicated pages to each countries model CV90 under “model” in the listings if available. 45 Mk3 CV9035 were ordered in 2005. Deliveries started in 2008 and were completed in 2010. 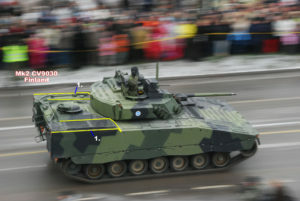 The CV9035DK has been deployed with the Danish Army as part of ISAF in the Afghanistan War. 44 surplus Dutch CV9035NL were purchased by Estonia in 2014. Deliveries started in 2015. 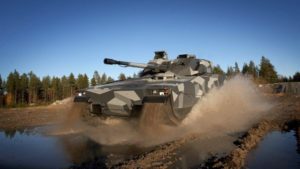 Finland has purchased a total of 107 CV9035 in 2 separate orders. The first order was in 2000, for 57 vehicles. These were delivered in 2003 to 2007. The second order was in 2004 for 45 vehicles. These vehicles were delivered from 2006 to 2007 with some vehicle components supplied from Finland. 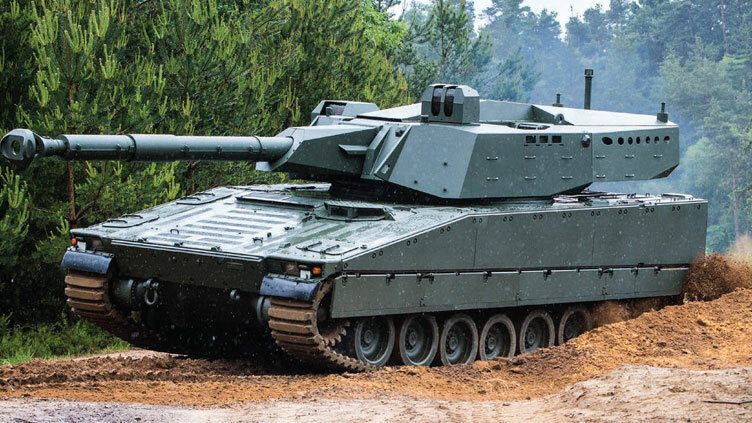 184 CV9035 were ordered in 2004 for the Dutch Army. Deliveries were started in 2007 and were completed in 2012. The Netherlands sold 44 surplus vehicles to Estonia. 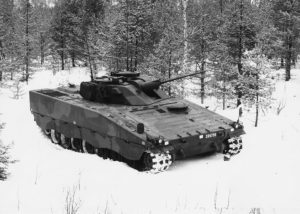 Norway initially purchased 104 CV9030 in 1994. Deliveries started in 1996 and were completed in 2000. 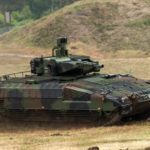 In 2012 the Norwegian Government announced it was over-hauling and upgrading its CV9030 fleet as well as buy new CV90 models, bring its total fleet up to 146 CV90 vehicles. Deliveries started in 2014, with 20 delivered as of 2015. The CV9030N has been deployed with the Norwegien Army as part of ISAF in the Afghanistan War. 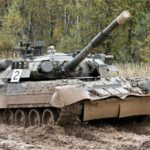 Switzerland purchased a total of 186 CV9030 in 2000 for $424,000,000. Deliveries ran from 2001 to 2005. 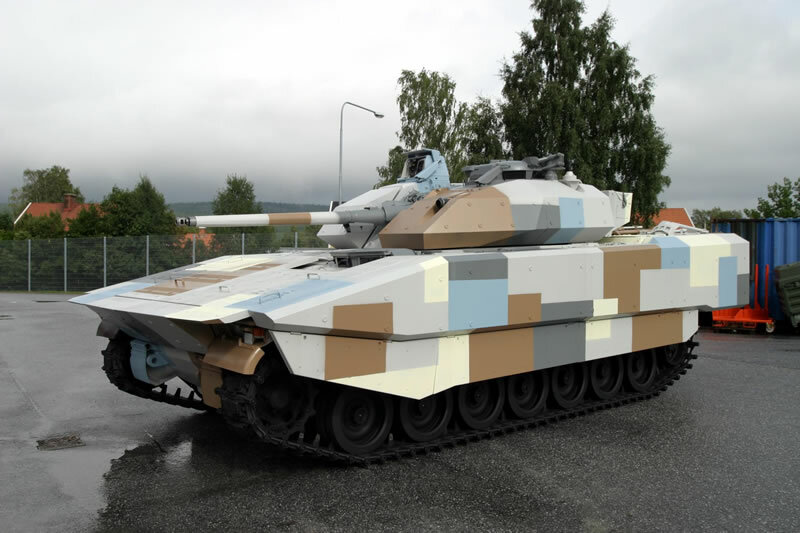 Originally developed and manufactured for the Swedish Army, the CV90 is locally known as the Strf 9040. It has been upgraded several times with the most modern model being the uparmored Strf 9040C. Development and prototype production ran from 1983 to 1991 when the first order was placed. 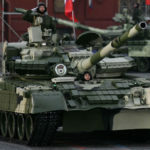 Production of the Strf 9040 and its variants was completed in 2002. The Swedish Army have deployed the Strf 9040C as part of both the Swedish UN-forces in Liberia 2004 and ISAF in the Afghanistan War.